THIS IS A GREAT PICTURE OF RIC FLAIR AND IN MY OPINION THE MOST UNDERRATED WRESTLER OF ALL TIME, THE "ENFORCER" ARN ANDERSON. 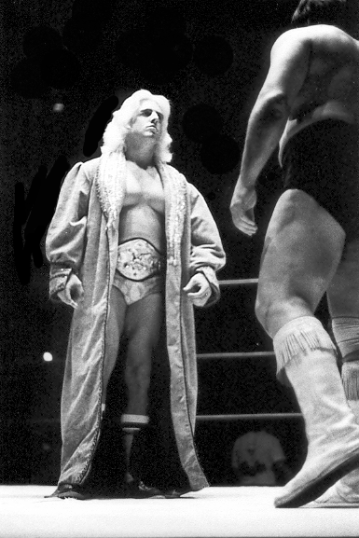 THE "ENFORCER" WAS NOT ONLY ONE OF THE GREATEST WRESTLERS EVER BUT HE IS PROBABLY THE 2ND GREATEST EVER ON THE MICROPHONE BEHIND "NATURE BOY" RIC FLAIR. NOBODY OTHER THAN RIC FLAIR COULD TELL A STORY ON THE MIC LIKE DOUBLE A.
RIC FLAIR AND HIS SON REID WITH THE ORIGINAL DESTROYER FROM 1999. RIC FLAIR WITH THE ONE AND ONLY PAUL BEARER, AND DON'T HE LOOK FUNNY WITHOUT ALL HIS MAKE-UP? RIC FLAIR AND FORMER WIFE BETH WITH THE LEGENDARY DORY FUNK JR.
RIC FLAIR IN THE RING GETTING READY TO WRESTLE ANOTHER LEGEND, WAHOO McDANIEL. MY PERSONAL FAVORITE VERSION OF THE FOUR HORSEMEN. 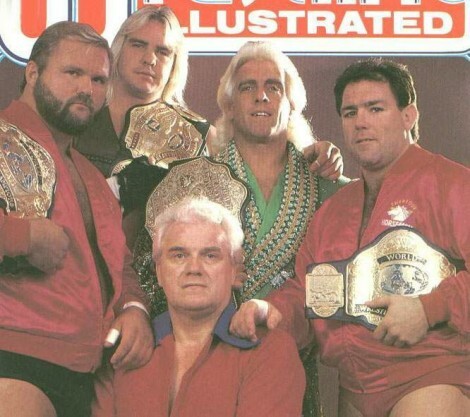 WORLD HEAVYWEIGHT CHAMPION RIC FLAIR, WORLD TAG TEAM CHAMPIONS ARN ANDERSON AND TULLY BLANCHARD, UNITED STATES HEAVYWEIGHT CHAMPION BARRY WINDHAM AND THEIR MANAGER J.J. DILLION. IN THE 90"S A GROUP CALLED THE NWO TRIED THEIR BEST TO BE ANOTHER FOUR HORSEMEN BY COPYING EVERYTHING THAT THE HORSEMEN HAD ALREADY DONE 10 YEARS EARLIER, BUT THEY COULD NEVER EQUAL THE GROUP THAT STARTED IT ALL, THE FOUR HORSEMAN. 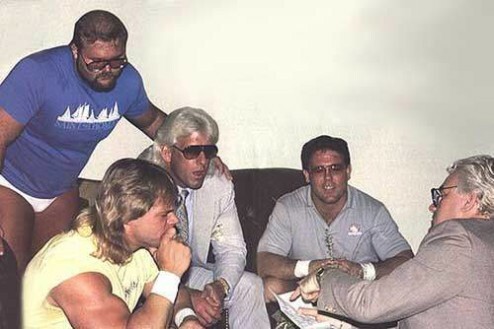 THE FOUR HORSEMEN WITH LEX LUGER IN THE GROUP.